I’ve overlaid men and women in a single chart here to make it easier to compare them. Earnings are shown relative to the year before the birth of a first child, and the trajectories of men and women are similar prior to childbirth. Generally speaking, men’s earnings start a little higher but women’s earnings accelerate a little faster. 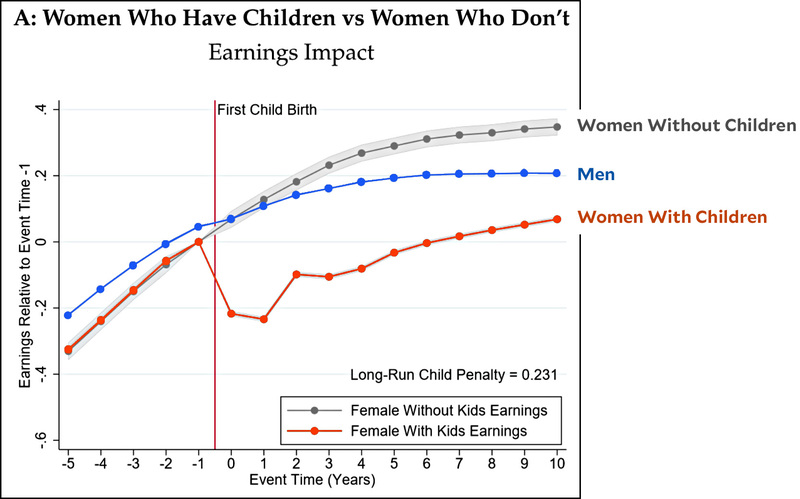 For women without children and for all men, regardless of whether they have children, these trajectories continue throughout their careers: men suffer no earnings penalty at all when they have children. However, women who have children take a huge hit in earnings. 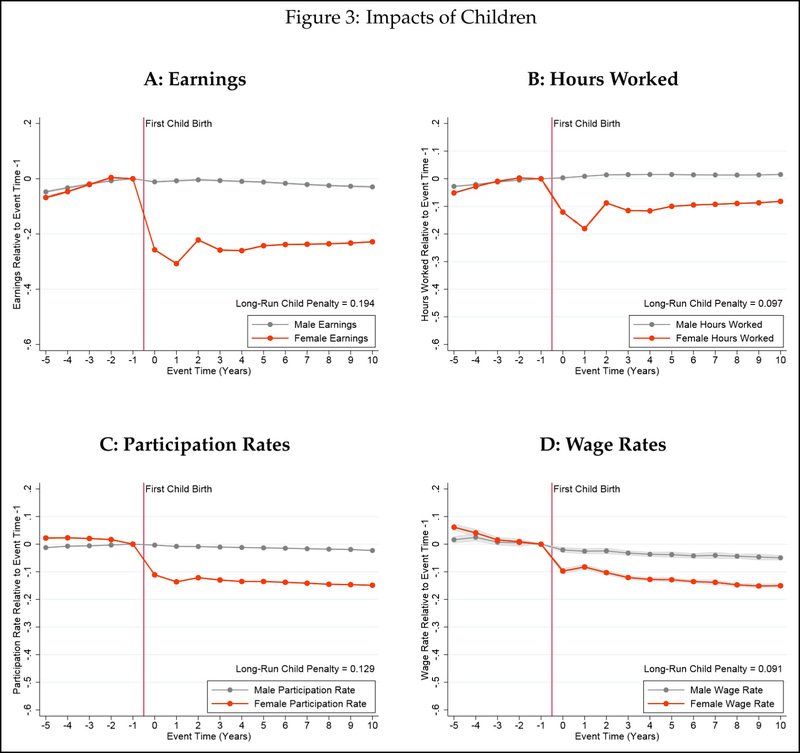 Women incur smaller earnings penalties due to children if they themselves grew up in a family where the mother worked more relative to the father….The size of this effect is roughly unaffected by including the detailed non-parametric controls for education and wealth…. [This] suggests that female child penalties are driven partly by female preferences formed during her childhood, rather than by male preferences formed during his childhood. Women from more traditional families form an early preference for working less when they have young children to take care of. Women from more liberal families don’t. In other words, it’s women from traditional families who account for the biggest share of the childbearing penalty. However, the size of the difference between traditional and liberal families isn’t large, so there’s clearly a lot more going on than just that. That’s the case in Denmark, anyway. Is something similar true in the United States? We lack the detailed administrative data of Denmark, so it’s not easy to conduct a similar study here. 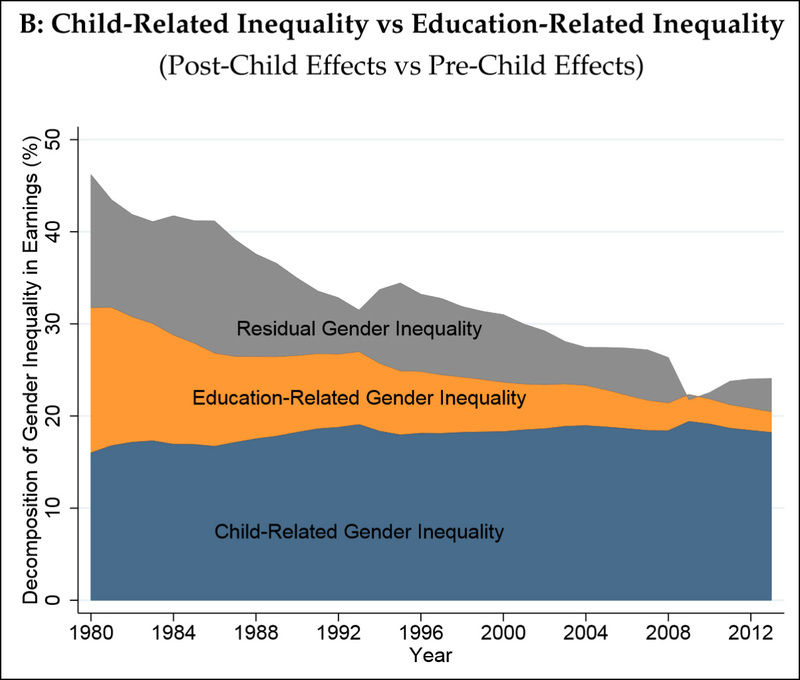 However, American studies do show that the gender gap in earnings opens up mostly between ages 25 and 35, which certainly suggests that children are the prime cause. More research, please.